Recently released from prison, David Marion doesn't expect to find a hitman at his door. Their meeting is lethal - for the hitman. Warned that a powerful secret organisation is after him, David disappears until the moment comes for him to strike back. Physicist Helen Freyl owns a colony of bees with unique venom. When her lover dies, she accepts a job offer from a giant pharmaceutical company who are close to finding a cure for radiation poisoning. But when the mysteriously sudden death of a colleague is followed by another, Helen begins to doubt her employers' motives and realises that her own life is in danger, too. 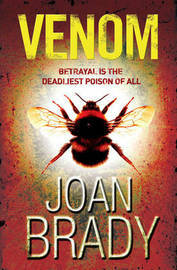 Venom brings David and Helen together as they fight for their lives against a backdrop of industrial espionage, corporate greed and human tragedy. Joan Brady was the first ever winner of the Whitbread Book of the Year with the remarkable Theory of War in the 1990s, which won her huge acclaim. She was born in California, and now lives in Oxford. Venom is her sixth book, following on from Bleedout which was a major success for Simon & Schuster internationally in 2005.